Since the first BIM Roadmap program in 2008 we have had plenty of positive feedback from those who employed BIM or started on a new BIM project. 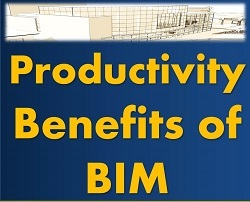 BIM brought about multiple benefits, including positive ROI, enhanced project collaboration, reduced (and sometimes eliminated) change orders and a project handover that provides the owner with facility documentation that makes sense. What technologies should be used by whom? In this session, construction technology pioneer John Jurewicz runs down the various tools and discusses who might use what, and the various complexities that one might plan for. Each tool essentially has input/output data, one or more specific functions, and certain minimum levels of skill to operate. 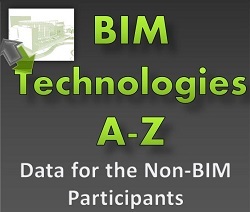 John runs down the various mainstream programs and apps that BIM users have come to rely on, providing highlights and tips about each. This program provides best practices regarding reliance on the model and outlining how to execute a BIM Execution plan, including how to address full lifecycle use of BIM, cost, schedule and maintenance. Make BIM the success it deserves to be on your projects. This 90-minute webinar will address the state of the art of BIM usage and how best practices should be incorporated into your contracting policies. 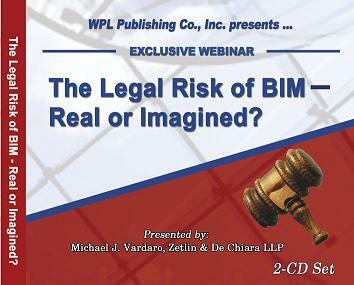 The Legal Risk of BIM — Real or Imagined? 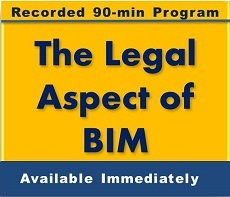 The full scope of BIM’s legal ramifications may take years to fully comprehend, but the most anticipated potential liabilities will be addressed during this 90-minute recorded webinar, including issues surrounding intellectual property and ownership interests and design and construction control concerns. Learn the challenges facing contractors and construction managers, and the productivity benefits they reap from their BIM implementations. Whether you're an owner, designer, contractor, construction manager or facility manager, this recorded webinar will provide you and your team with a wealth of field-proven practices that will help you take your BIM participation to the next level. 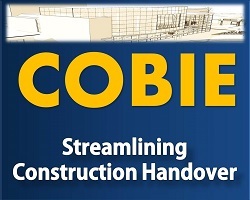 The Construction Operations Building Information Exchange (COBIE) is an emerging worldwide standard for capturing equipment lists, data sheets, warranties, spare parts list and preventive maintenance schedules.While the immediate benefit of COBIE allows owners to begin efficiently operating their facilities at Beneficial Occupancy, the ultimate benefit of COBIE is that contractors can eliminate the paper-case and job-crawl currently required when creating construction handover documents. In this 90-minute live interactive webinar, Finith recaps the value proposition of BIM and how it has evolved since the book was first published in 2007, transforming itself into an indispensable tool not just for the design team, but for contractors and CMs, and as an asset management tool for owners. BIM is also transforming the way we do business, enabling more fluid design-build delivery, with improved construction collaboration resulting in higher quality and safer projects. Finith has developed unique approaches from his 10+ years experience in helping other implement BIM. Today, design and construction professionals are challenged to build projects faster and cheaper with the use of technologies like BIM, tablets and custom-designed apps. A less publicized and used technology, 3D laser scanning technology can prove beneficial to all stakeholders throughout the life cycle of a project. 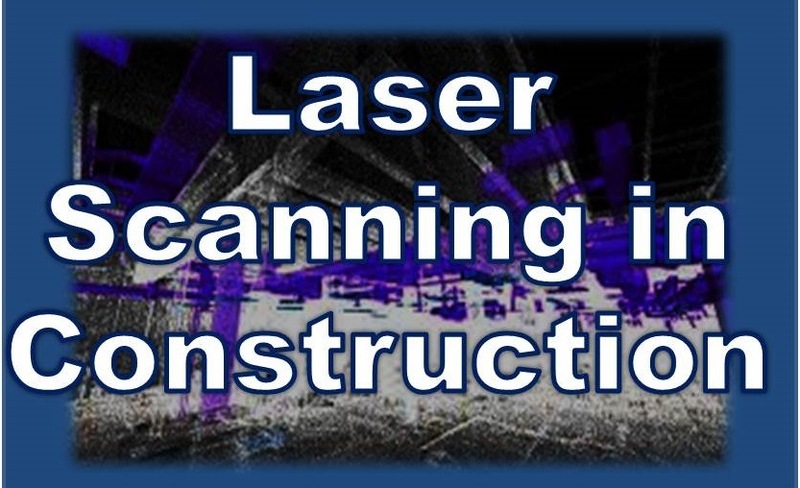 This course provides an overview of the current processes and procedures utilizing point cloud models and laser scanning in the AEC industry. 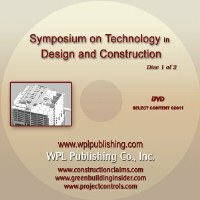 The use of computer-generated modeling by design and construction teams continues to grow at a rapid clip. This technology, most commonly referred to as Building Information Modeling (BIM) or Virtual Design and Construction (VDC), creates new opportunities for advanced collaboration and project coordination. This program will focus on the opportunities and ways to manage contract and legal risk, real or imagined, that will help keep all parties out of court! This year's BIM Roadmap webinar series will help you benefit from learning more about practical aspects of BIM to overcome existing stumbling blocks. This includes integrating BIM with standard construction practices, exploring how to engage architect/engineers more fully, addressing the project documentation handover for owners, and a walk through of standard form contract documents that did not exist seven years ago. Gather your team together for this unique interactive webinar series to take your BIM initiative to the next level. 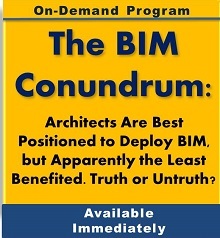 The BIM Conundrum: Architects Are Best Positioned to Deploy BIM, but Apparently the Least Benefited. Truth or Untruth? This webinar, part debate between an architect and a contractor, with the contractor representing both the contractor and owner's point of view, exposes the sensitive position many architects find themselves in. BIM is more than a design and coordination software, it is a process of communication. BIM is key to improving design, estimating, scheduling, lean construction and owner deliverable practices. This program will help you learn more about practical aspects of BIM and how to overcome existing stumbling blocks. This book provides the tools architects need to synthesize and reuse complex data, solve problems early in the design-build process, save costs, and increase profits and productivity. 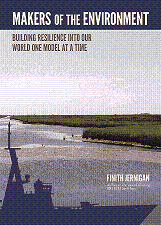 Using virtual information models and the latest technology, Jernigan is able to streamline decision making, improve project visualization, and achieve superior results during design and construction phases. 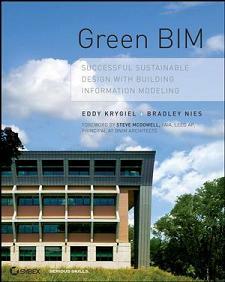 The book shows you how to effectively use BIM to overcome design challenges and apply an integrated practice approach for successful architectural projects. This resource makes the business case for building information modeling (BIM), how it can improve collaboration, facilitate better design and construction, optimize workflow and reduce error. It discusses the barriers to BIM, from business culture to training, and how these barriers can be overcome. Case studies describe how firms throughout the building design, construction, operations, and management industry have benefited from BIM. A useful guide for professionals in architecture, engineering, and construction, Building Information Modeling provides insightful accounts from early adopters of BIM and shows how it has given them a competitive edge. This 90-minute recorded webinar looks at the expanding use of BIM for project lifecycle purposes, including scheduling (4D), cost estimating (5D), sustainability review and facility management. 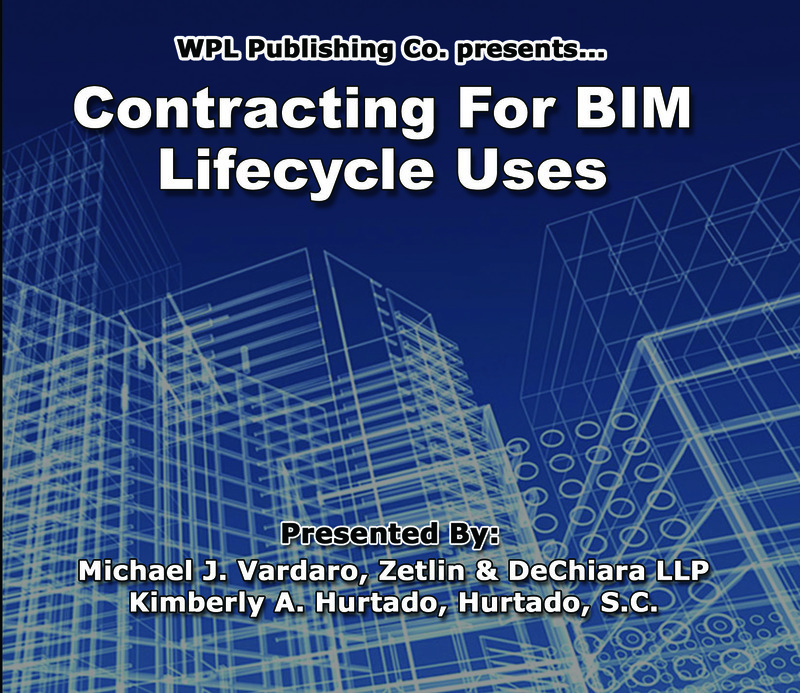 It also discuss issues that may arise in modifying standard industry BIM contracts to establish meaningful deliverables for these new lifecycle BIM uses. 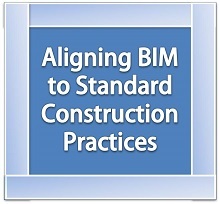 BIM implementation is more than a simple clause in a contract that says to use BIM. BIM implementation poses a complex new set of risk allocation and management challenges. 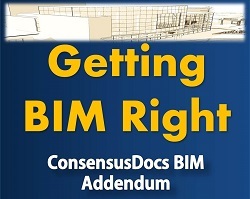 Fortunately, the industry has caught up to the technology and several sets of BIM contract addendums and implementation guides have emerged from various organizations. Despite the new thinking required, BIM has been proven to be a better way of building, and is more likely to reduce claims and legal issues. 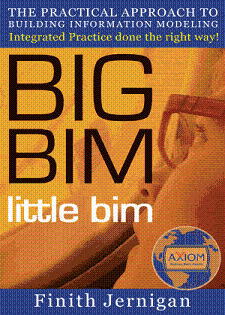 BIM implementation has not expanded as rapidly as was projected five years ago. 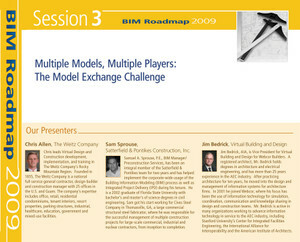 In 2008, in WPL Publishing's first annual BIM Roadmap series, early adapters of Building Information Modeling (BIM) recounted how its use was revolutionizing the way contractors, architects and owners do business — slashing project delivery time 25% (and sometimes more), cutting claims and change orders to near zero, saving millions of dollars in incorrectly specified materials and fixtures, slashing legal fees and reducing contractor liability ... and putting big smiles on clients' faces. There's no substitute for experience. This trio of major construction firms has dozens of BIM projects under their belts. They understand the direct benefits of BIM, but more importantly, can relate the value that BIM brings to project delivery, teamwork and collaboration. Handoff, 30-yard pass or fumble? How is the data in the model made available to other members of the project team? Is the data transferred, loaned, exported or shared? What about keeping changes in sync? Who is responsible for maintaining the data and for maintaining the model? What happens when there are multiple models? These are the questions and challenges facing BIM users everyday, and this session will help you understand the mechanics of multiple parties that must share and work with the various models. Owners are the obvious, intended beneficiaries of completed projects. They expect to occupy the building, to enjoy a fully functional HVAC system along with other equipment and systems deployed on the project, and to be handed over a project "user manual" complete with all warranties, equipment operating instructions, maintenance requirements and any additional reference material needed to repair, replace or make upgrades in the future. As BIM continues its transition into the standard of care for project delivery, much has been made of BIM’s ability to support these owner expectations at close-out. Indeed, initiatives such as COBIE are aimed squarely at this issue. 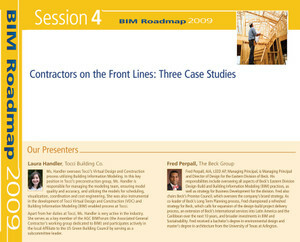 With both federal agencies and private owners increasingly requiring COBIE, or COBIE-esque close-out requirements, this session will explore some of the critical planning steps for owners and why it is necessary to start planning for the transition at the project concept stage, monitor progress during design and construction, and capture best practices upon close-out and turnover. Watch leading experts at this exciting symposium presented on your computer. Includes more than 10 separate sessions -- choose the ones you want to watch. 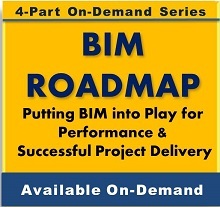 A valuable listen-to for any A/E/C company planning to use BIM in the coming years. The advent of BIM technology promises to improve the overall design systems for construction projects, and is likely to become the dominant system for project design delivery. 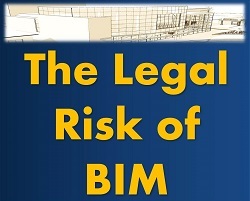 However, as BIM begins to blur the allocations of responsibility developed over many generations, it has become necessary for architects, engineers, contractors, owners and developers to adapt their legal safeguards accordingly.